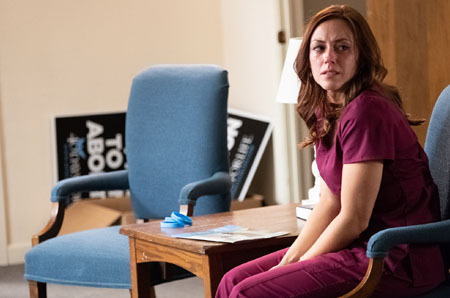 While major media film critics mainly wrote it off as anti-abortion “propaganda,” other reporters have acknowledged the success of the pro-life film “Unplanned”. Unplanned made $6.1 million in its first week, finishing fourth in the box office standings. As of April 6, the film remained No. 4 at the box office and had brought in more than $8.6 million. Ashley Bratcher as Abby Johnson in ‘Unplanned’. When it came to reviewing the film, however, Forbes’ Luke Thompson followed the MSM’s lead in trashing it. Variety noted that Unplanned “doubled expectations” in its opening weekend. Writing for The Washington Post, Marc Thiessen, a former speech writer for President George W. Bush, dismissed accusations that Unplanned is a propaganda film, pointing to its negative portrayals of some pro-lifers and sympathy for heroine Abby Johnson’s earlier compassion-based pro-abortion stance. “But the movie also shows us what really takes place inside a Planned Parenthood clinic,” Thiessen wrote. Some observers say the mostly negative reviews are indicative of the divide between the MSM and American society. The film review site Rotten Tomatoes seems to back up that assertion. On Rotten Tomatoes, the reviews of MSM critics were in a 50-50 “Fresh/Rotten” split, while 93 percent of voting audience members liked the film. By April 6, the @UnplannedMovie Twitter account had 348,698 followers; that’s more than Planned Parenthood, which has slightly over 260,000 Twitter followers.